This product category is telling about a type of bag is basically deals with Cattle Feed Bags. This is the only product we are manufacturing in this product category. Polypropylene or High-density polyethylene is being incorporated in the manufacture of the same. 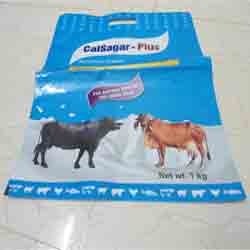 The purpose of Plastic Cattle Feed Bags is the packing of cattle feeds. Different sizes and multi coloured printed bags are available with us. Strict quality parameters are maintained to avoid spillage, leakage etc. Looking for Cattle Feed Bags ?